Murder Creek in Akron Falls Park. The quickly moving water powered small mills in the early 1800s. Happy Halloween. . . . This story has been retold around Akron, New York, a village in the town of Newstead, over the last two centuries. Even the official website for Erie County has a variant of it online. The definitive tale is by Arthur C. Parker, who recounted it in The Life of General Ely S. Parker: Last Grand Sachem of the Iroquois. It was published by the Buffalo Historical Society in 1919; any more recent publication appears to derive from that source. The below version of The Legend of Murder Creek was part of their 4th Grade local history curriculum at Akron Central School in the 1980s. I do not know who wrote it or if any other copies exist today, but it is definitely a direct adaptation of Parker’s book–even reusing the final sentence. Akron Falls was known as Falkirk Falls for a time, and Falkirk a distinct settlement from Akron. 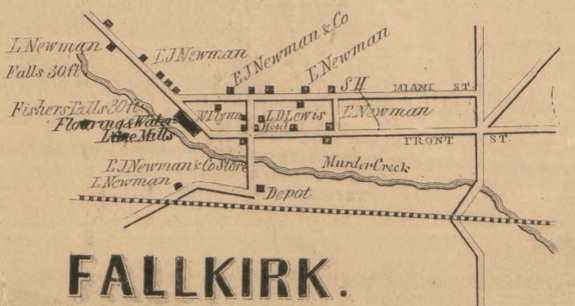 This map from 1855 added an extra “L” to the name. East Avenue now runs along Murder Creek. The Legend of Murder Creek. Murder Creek was originally known to the Indians as See-un-gut (roar of distant waters). This legend tells how the name was changed. In the spring of 1820, a white man, named John Dolph came from Mohawk country near Utica and built his log cabin close to the See-un-gut. 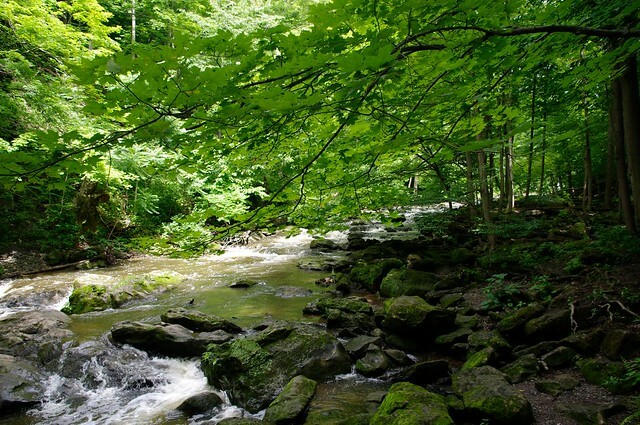 The creek attracted many settlers in those days because it was necessary to be near water as a source of power to operate mills. It was also important for the settler’s personal needs. The Dolphs hid the girl and allowed the man in. He looked around the cabin to see if he could find her. He couldn’t, and flew into a rage muttering, “She shall not escape, I will find her yet!” He then left the ca[b]in and hid himself in the woods. Mr. and Mrs. Dolph then listened to the story of Ah-weh-hah’s (Wild Rose’s) life. My home is near Spirit Lake, under the cliff about a mile below the Tonawanda Falls. My mother has been dead several years and my father, a chief of the Senecas, has just been murdered by Sanders. For more than a year, this dreadful man has been staying around Spirit Lake begging me to marry him. I love Toh-yon-oe (Gray Wolf) and will become his wife very soon. Sanders told me that rather than see me the wife of a Seneca, he would murder me and all who stood in his way. My father and I were going to the Cattaraugus nation to avoid trouble. Gray Wolf was going to meet us there. We started out on foot, taking the old trail, leading to Te-os-ah-wah, a place called Buffalo by your people. When we reached the See-un-gut my father sat down to rest. Sanders came up behind us and said he was sorry for his past conduct. He wished me happiness in my life with Gray Wolf. The man spoke so nicely, he tricked us. When I turned to look eastward, I heard a blow strike and then a groan. Quickly I turned to see my father laying dead on the ground with Sanders standing over him with a club in his hands. I fled into the forest with him close behind yelling he would kill me too. Here I am. You know the rest. The Dolphs located Gray Wolf and informed him of the tragedy. He came to his sweetheart and together they journeyed to her father’s grave where John had buried him. They chanted the death song, as a last token of their affection. A grave fire was lighted and the sacred tobacco incense rose to life the burden of their prayer to the Maker of All. Suddenly Sanders appeared from behind a tree. He and Gray Wolf struggled with knife and tomahawk until Sanders fell from losing too much blood. He was dead. Gray Wolf tried to speak to Wild Rose but instead staggered forward and fell. They had both died at her father’s graveside. Mr. Dolph heard her cry. He found her on her knees sobbing the death chant. John then buried both bodies and comforted Wild Rose. She often went to visit the graves of her father and sweetheart to chant her grief. One day the Dolphs missed her, they went out to the graveyard and found her lying upon the grave of Gray Wolf, dead of a broken heart. Beside the graves of her father and sweetheart she was buried. As the legend goes ——- if you stroll along Murder Creek at midnight, you may hear the voices of the two lovers as they wander over the new dust on the ancient trail. Death united them in a bond the years have not broken. This entry was posted on October 31, 2014 by Fred Schrock. It was filed under Uncategorized . Parker actually took the 1919 version of the story from a 1906 book written by Uriah Cummings called “The Haunted Corners”. Cummings owned the land which is now Leisurewood. He and his brother ran their cement mill there and lived on the top of the ledge. Uriah Cummings wrote his book to explain the ghosts that haunted the woods on his property. The Dolph family is actually buried in Ledgelawn Cemetery on Rt 5 near Brauns. The legend is an historical account of an actual event. I’m a total nerd, I know. I’m sorry. The fact that it is based a true story always fascinated me. I have pictures of the Cummings Cement Mill, John Dolph’s grave, old maps showing their house at the bottom of the hill on Cummings road, and Uriah Cummings house up on the ledge. His booklet is pretty amazing – he truly believed in ghosts and people felt that Cummings Park – which is what they called Leisurewood at the time – was really haunted. They are four graves up there somewhere…..likely near where the Buffalo statue is today. The only remaining copy of Cummings’ book is housed at the Research Library of the Buffalo and Erie County Historical Society. It’s an amazing read and account of what appears to have been an actual historical event. Old maps show the Dolph home at the bottom of the hill on Cummings road. Cummings writes that he had in his possession the diary of John Dolph and that he took most of the information for the story from Dolph/s personal papers. Great info! That certainly makes sense especially after reading some of the lines in Parker’s text. Is it true that what is now Bloomingdale Road used to meet up the trail that is now Route 5 near that cemetery? I’ve heard that but have never seen anything about it, though the lines would match up. The Cummings booklet is amazing. He’s not only telling the story, but trying to convince the reader that he isn’t crazy for believing in ghosts. Uriah Cummings wasn’t a crackpot – he ran two cement companies in Akron and his son, Homer actually went on the become Attorney General of the United States under FDR. Yes, the Seneca Trail ran along Bloomingdale and through what is now Russell Park. The Sulphur Crossing was right behind Renns – in fact the original name of Murder Creek was Sulphur Creek (it’s on Joseph Ellicott’s first map of Erie County). I have pictures and documents if anyone wants to email me at msaglian@hotmail.com. Homer Cummings personal papers are held the library at the University of Virginia – they sent me pictures of the houses that existed in Leisurewood as well as Homer’s pictures of his father, Uriah Cummings. Parker’s account follows the Cummings account word-for-word. He adds some detail that Cummings doesn’t have but it is great documentation. It looks like the Parks Department adopted the story around 1948 to explain the name of Murder Creek. Ironically it’s around 1824 that the name of the creek changes on maps to “Murder” – the same time that the Wild Rose story is reported to have taken place. Hello! I grew up on Cummings Road in Akron at the bottomed the hill. I’ve always been fascinated by our history! The home has been in our family for well over 100 years now. I grew up hearing about leisure wood being full of mansions, we’d go back to the towers every once in a while. Scary! The fountain in Russel Park is missing the cherubs. They were “stolen”. Rumor has it that someone in my family was involved! So much cool stuff! I wish I knew more! An ardent history buff, I was looking up the history of Akron and Murder Creek and stumbled across your blog here…. fascinating! This is the only place I’ve been able to read the legend of Murder Creek… growing up in Akron, I heard various forms of the tale (a woman drowning her child then herself in the creek stands out, I heard that one several times) but never the “official” story. I’d love to get my hands on that Cummings booklet. Thanks for the info, I’ve enjoyed perusing your site! I have lived in Akron all my life. My fathers property buts up to Adessa (Hard Rock Quarry) & Leisurewood. I went there as a child till Adessa came in and fenced everything in. I wood love to read the book & see the pictures you have.